An exit ticket to use at the end of a lesson to help children reflect on their learning. Ideal to use at the end of a lesson for children to reflect on their experiences. 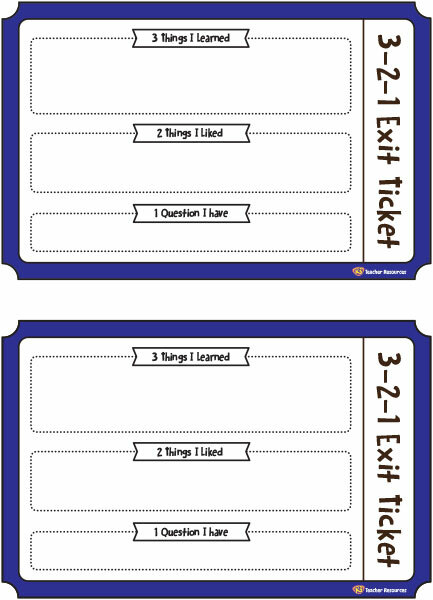 Print, cut and laminate a class set of 3-2-1 Exit Tickets. Provide each child with a ticket at the end of a lesson. Ask the children to use the ticket to reflect and record three things they have learned, two things they liked and one question they still have. Encourage the children to hand in their ‘exit ticket’ as they leave the classroom.